Rabbits have besieged the flower garden at Azalea Manor bed and breakfast, here in historic Madison. Seen here, the culprit attempting to hide by holding still. He's been, "eating my flowers!" According to the proprietor. also known as the "swamp rabbit" or a Sylvilagus Floridanus also known as a "cotton tail." The Swamp Rabbit, found only in the swamp lowlands along the Ohio and Wabash rivers, spending much of its time up on stumps and logs, although it swims readily when pursued. The swamp rabbit is actually larger than the cottontail, reaching almost six pounds. What's known as the "Eastern Cottontail," Sylvilagus floridanus, is found throughout the eastern two-thirds of the US and all the way south through Mexico. In this range, there are 12 subspecies with only one native to Indiana, Sylvilagus floridanus mearnsii. The cottontail is reddish brown to gray along the back and sides, while the underside is gray to white. The underside of the tail is snow white and is very bright when the rabbit runs, thus the name cottontail. The cottontail and it's tracks have been found in the heart of the cities, including downtown Indianapolis to the deep forests. 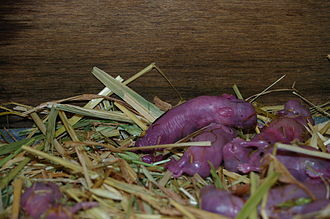 At birth rabbits are born completely helpless, blind, without fur, and weighing less than an ounce. When rabbits are born their life expectancy is very short, about 4 months. Life expectancy of rabbits change as they get older. That fraction who survive longer, are expected to live longer. If they survive long enough to leave the nest, their life expectancy at that time reaches to about 11 months. If they don't successfully weather their first winter the odds aren't good. However for those that do, their life expectancy stretches out to about 3 years. Warning: Do not attempt to keep or handle a wild rabbit as a pet. Wild rabbits, nor their progeny, will ever become docile, or safe to handle. A hind claw to the eye of a child may hurt the rest of his or her life. There are "domesticated species" of rabbits legally available, which behave quite differently. Further you should read about "rabbit's re-digestion" before keeping one as a pet, specifically re-eating droppings. Rubber snakes and repellents yield mixed results, but would be the least invasive to your garden plans. Use half inch mesh wire/cloth/or chicken mesh cut into cylinders around the plant. It should be forced or buried into the ground to hold upright and discourage attempts to sneak underneath. Commercial tree guards and wrapping are also available. To protect an entire garden, use a fence at least 2 feet high of chicken wire or strong hardware cloth, but with the bottom tight to the ground and buried a few inches. Be sure the mesh is 1 inch or smaller. Its suggested to remove brush piles and anything else rabbits might consider cover near the garden to make fewer areas for rabbits to hide. However this may not help, since flowers, shrubs, bushes and trees in your garden will likely provide all the cover they need. Place a dome or cage of chicken wire over an entire small flower bed to allow vulnerable plants such as tulips to start growing before leaving them unprotected. WARNING: You need a permit to trap or shoot rabbits from DNR, or you will need to use methods legal only during open hunting season (firearms can only be used where legal). Cage-traps that don't harm the rabbit baited with dried apples or dry ear corn can be effective in capturing rabbits.